It's been around for decades, but, unlike regular 3D, virtual reality (VR) has yet to make a big impact in the movie industry, something a maker of Hollywood animations believes can change - if the films are good enough. Eric Darnell, who co-wrote and directed the "Madagascar" movies, showed his own VR film at the Venice Film Festival this week, "Crow: The Legend," in which the viewer is immersed in the story of a mythical bird that has to fly to the sun to bring back warmth to the Earth. 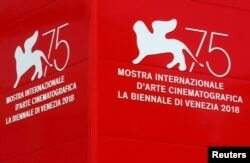 The logo of the 75th Venice Film Festival is seen in Venice, Italy, Aug. 28, 2018. "The technology has to get better, headsets have to get cheaper, the content has to get better and that's at least as important as anything else," Darnell told Reuters. "It's a chicken and an egg thing. You can make all the great headsets you can but if there's not great content ... what's the point?" 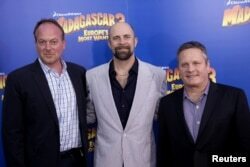 FILE - Directors Tom McGrath (L), Conrad Vernon and Eric Darnell (R) arrive for the premiere of "Madagascar 3: Europe's Most Wanted", in New York, June 7, 2012. "I think the way we are really going to get there is by putting the viewer inside the story," Darnell said. "Not just playing a story for them, putting them inside the story so that other characters recognize that the viewer is there and that it means something to them, that you are in their world."